It has now been just over a week (19th June) since the ban on Microbeads came into effect here in the UK. From now on retailers will not be able to sell rinse-off beauty and personal care products which contain them. This follows on from the ban on the manufacture of products containing microbeads came into force back in January and forms part of a 25 Year Environment Plan by the governmental commitment to eliminate avoidable plastic waste. For those of you not in the know, Microbeads are tiny pieces of plastic (micro-plastics) which give exfoliating or abrasive qualities to cosmetics products such as face wash, toothpaste and shower gel to name a few – In fact you would be surprised by the amount of products they actually can be found in! Most frequently made from polyethylene, they can also be made from other petrochemical based plastics such as polystyrene and polypropylene (PP) and are usually smaller than 0.5mm in diameter (the image above is a plastic microbead from a facewash, taken via scanning electron microscopy; it is about 0.5mm wide). As with most things that can be protetially detrimental, microbeads are rarely (if ever) named as such in a list of ingredients. Consumers looking to avoid microbeads should look for words such as polyethylene terephthalate (PET), polymethyl methacrylate (PMMA), polytetrafluoroethylene (PTFE) and nylon when reading the back of a tube or bottle. What’s so bad about them? Microbeads are near invisible to the naked eye and according to Greenpeace, one single cleansing product can contain as many as 360,000 microbeads! Water Treatment plants are not designed to filter out microbeads and so these pesky little beads pass through water filtration systems and consequently end up in our oceans and water ways. In 2016, a report issued by the House of Commons Environmental Audit Committee stated that approximately 100,000 microbeads can make their way to the ocean from a single shower! 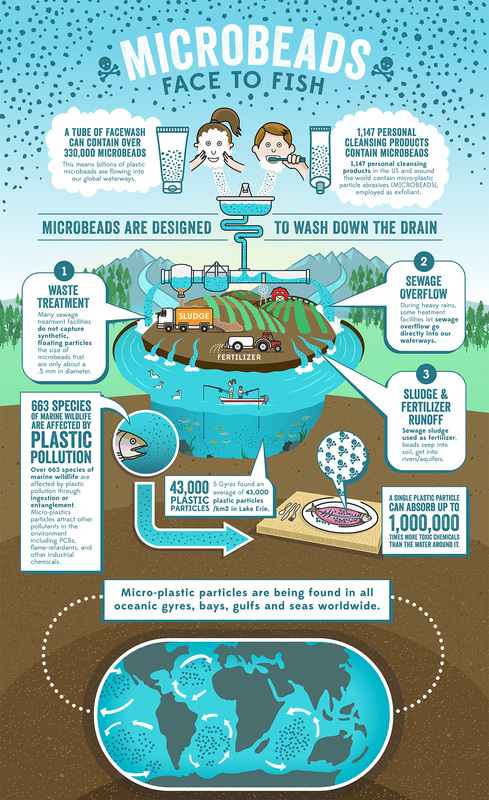 Of course it isn’t just our marine life, oceans and waterways thatcan be effected by these little beads. Wildlife and even our own health are effected either directly or indirectly. So the ban will stop all that right? Well, not really. Whilst the ban goes some way to reducing the amount of micro plastics which end up in our waters, it is important to remember that it only actually applies to rinse-off products and does not restrict the use of microbeads in other cosmetics. Unfortunately the ban does not cover a long list of products, such as sun-cream, lipstick and paints – and of course microbeads are only one part of the huge plastic pollution problem we currently face. Although arguably a lot less significant in number than those found in rinse-off products, microbeads from other sources are still making their way into the water. The poll also found that the majority of people who wear any make-up (61%) rarely or never read product label information regarding removal methods for face, eye and lip make-up products. You can read result of the survey on the Greenpeace website here. I have admit I was surprised by these results. Despite knowing microbeads were present in many products, I hadn’t realised the extent of the use in cosmetics. There are many natural alternatives to micro-plastics. Just like microbeads each vary in the way they exfoliate the skin. If you are looking for mild exfoliation then rolled oats are a great option; they are ideal for soothing irritated skin. For a slightly stronger buff then ground almonds and jojoba beads are worth a try. Finally for a real scrub try sugar or coffee grounds – I would not recommend these for use on the face as they can be a little harsh but for a body or foot scrub they are ideal! There are DIY recipes aplenty out there. I have a whole heap of books packed with recipes which I go through when looking for something specific but if I am looking for online inspiration I always take a look at Clean Beauty Co. There are loads of brands on the market that are free from plastic ingredients – many of which we know and love and have featured on here (Odylique,Weleda, Neal’s Yard Remedies and Green People to name just a few – the list can be found here). Brands and companies that do not use microplastic ingredients in their products can carry the Zero Plastic Inside logo.